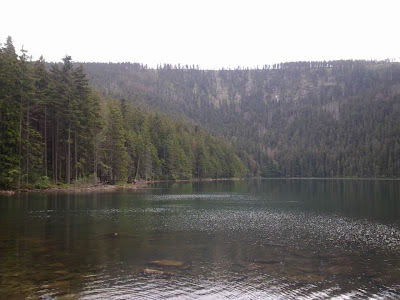 An afternoon of heavy duty climbing today brought me out at Cerny Jezero (Black Lake), which is said to be not only bottomless, but unmeasurable. From there it was more climbing then a long descent into the frontier town of Zelezna Ruda, where I'm spending the night. Tomorrow I'm aiming for the highest point of my entire lap of the Czech Republic - the summit of Polednik.